This acid-stained finished basement concrete floor had 3.5' diagonal Spanish tiles cut in the interior and an 18" border along the walls done in a contrasting color. Notice the distinct color separation on both sides of the border. For a large open floor not obscured by a lot of furniture or rugs, saw-cutting or "scoring" decorative lines and simple geometric patterns into acid-stained concrete and cement overlays is a great way to break up the monotony of a single color and draw more attention to the floor. Decorative concrete scoring lines are generally made with a guided angle grinder or concrete saw fitted with a diamond blade and a dust-free vacuum attachment. The most common cuts are about 1/8" wide and 1/4" deep, although exact dimensions may easily be adjusted by the contractor, if the customers wishes. 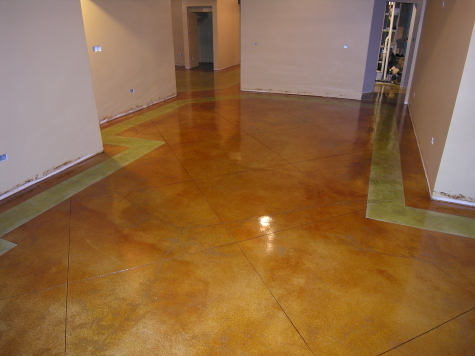 These decorative cuts are usually done prior to acid-staining the concrete and may be filled with a colored grout, polyurea joint filler, or elastomeric urethane joint sealant to accent the colors in the floor, or left alone, for a more subtle appeal. Decorative scoring was done to this hallway section of an acid-stained concrete floor in a mall, with color separation, to create a "leading effect" for shoppers. Straight wall borders and large square or rectangular tiles are the most popular patterns, while arcs, curves, circles, and diamonds are selected for a more contemporary or artistic look. For additional accenting, concrete scoring lines may be used to separate acid stain colors. Separating colors usually involves a few extra days' labor for a concrete staining contractor, so the customer should expect to pay more per square foot. Decorative concrete scoring patterns usually add about $.75-$1.50 per square foot to the cost of a project, depending on their complexity. Decorative saw-cutting is generally not a problem with concrete slabs that contain radiant or "hydronic" heating, as long as the tubing was properly installed and is at least 1-2" below the surface of the concrete. An example of a control joint in a basement concrete floor that looks out of place once the walls went up. We made additional saw-cuts before staining the floor to make a symmetrical design. Decorative saw-cuts are also a great way to incorporate unsightly, existing control joints into a larger overall pattern on a stained concrete floor, and camouflage them. Often, excessive numbers of joints are placed in concrete outdoors as a way of minimizing or eliminating cracking. Indoors, a different problem occurs: isolated, single joints appear randomly in important living spaces or throughout a series of rooms, detracting from the overall ambience of these areas. These joints are seemingly misplaced because the concrete floor in a house or building is placed before the walls go up. By strategically placing additional, decorative saw-cuts in a floor, however, these "misplaced" joints can become part of a larger pattern that gives overall symmetry and consistency to the space. 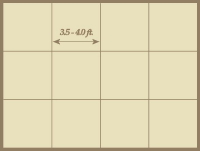 The most popular acid-stained concrete scoring patterns are linear in nature. Below are some of the most common patterns.